What We Didn’t Say tells the story of Jack and Laura’s marriage mostly through the medium of his diary account of a difficult time in their relationship, as well as some emails between the two. In the book, the diary is being shared with their son, Mike, and has many ‘corrections’ from Laura telling her side of the story. Jack and Laura’s relationship hasn’t been easy. He was older than her, her lecturer at Uni actually, and I think he always has that fear that he is too old. This leads to a lot of jealousy on his part. I felt quite annoyed with Laura at times as you come to realise through her edits that if they had just spoken frankly and actually listened to each other, there would have been fewer arguments and frustrations between them. But then I also felt annoyed with Jack as he always seemed to believe the worst of Laura. So in a way they were as bad as each other. Through this book, the reader is shown the importance of expressing yourself and communicating with your partner. It shows that love however strong can be worn away through misunderstandings. But it also shows that if it is strong enough, love can overcome so much. I think there is much in this poignant read which readers will be able to relate to. A book that shows the importance of honesty and communication. My thanks to the publishers Twenty7 for the review copy of the book. 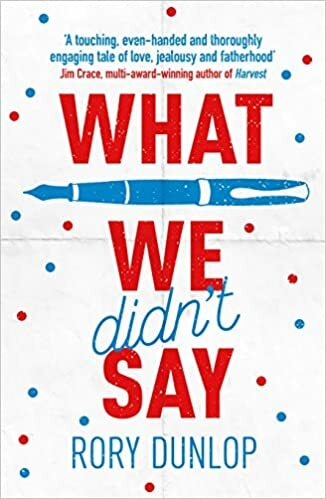 What We Didn’t Say was published as an ebook on 30th June with the paperback to follow in October You can order a copy here: What We Didn’t Say. Jack and Laura have separated. Jack thinks it’s all Laura’s fault. Wryly sarcastic and intensely well-observed, What We Didn’t Say is about that gap between words and feelings where relationships live – and die.